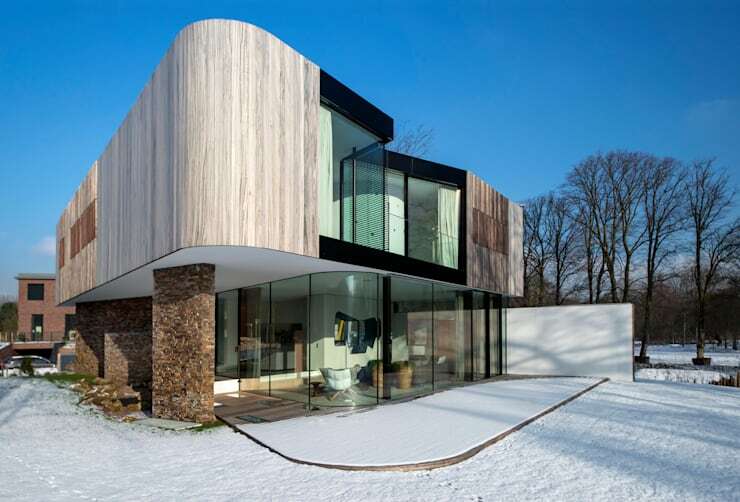 This homify 360° article takes us to the northern part of the Netherlands, in the prosperous town of Bloemendaal. 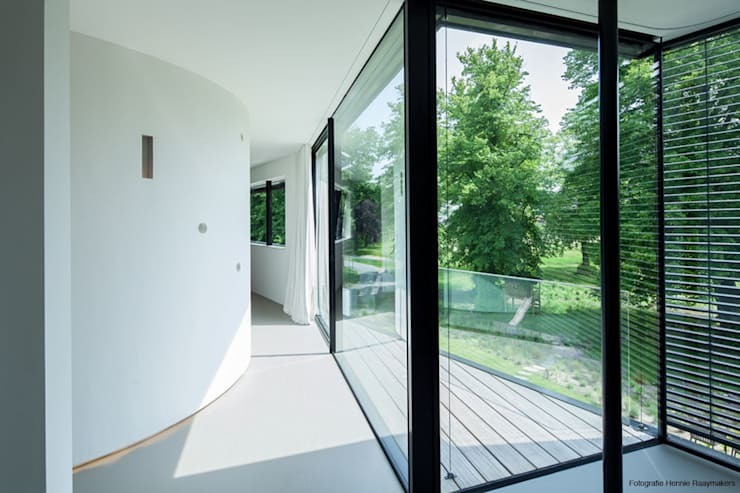 More specifically, the architectural project that you will soon see, is located in the new residential area of Duin & Beek, bordering the National Park Dunes of Kennemerland, and has in this case, a naturally impressive, green and hilly landscape. As previously mentioned, the project is set in a verdant natural environment, surrounding the villa and the shell with pleasant vegetation. This private residence of 517 square metres, has the luxury of owning outdoor spaces on both sides of the house, as it is located on a plot which is more than 1330 square metres! Also, we see that this openness of the landscape was considered by the architects in the design of the overall volume of the building, which by its asymmetry and timely interventions, creates an interesting dialogue with the entire landscape. Moreover, the external composition is rich and diverse, with angles that intersect with curved surfaces, and occasional openings which punctuate the massive walls. 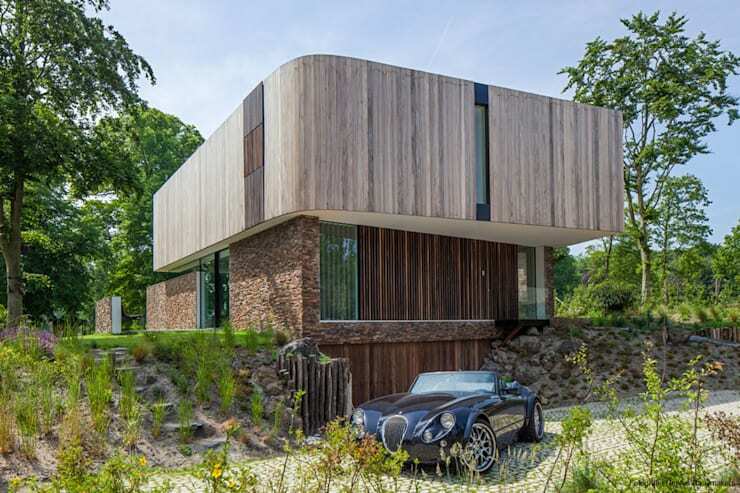 The architects also chose natural materials like stone and untreated wood for the panelling, to create a more harmonious relationship with the environment. In opposition to the previous photo, whereby we saw a largely closed façade, from this angle, we see the living areas. Designed almost entirely with a glass wall, this innovation creates an open and unobstructed view of the terrace and surrounding natural panorama. Again, volumetric games are played between curved surfaces and angled interventions, creating a rich spatial vocabulary that is emphasised by the change in materials on show. This has been achieved by the combination of massive stone walls on the ground floor, followed by light grey wooden external panelling, and finally, the impressive glass openings that give character and charm. It should be noted that the position and size of the openings have been reflected to create intimate areas too, yet still maintaining a connection with the outside. The ground floor of the villa welcomes us into the living spaces, where you will find an open plan dining room and kitchen also. This layout allows both occupants and guests to enjoy the view to maximum capacity, as with the many large glass openings, the scenery is invited inside. To create a visually stunning distinction between the two spaces, whilst retaining the idea of openness , a storage unit pierces the space, letting the viewer peer inside the neighbouring room. Furthermore, the dining room space is double height, and to add character and hierarchy, two large spherical chandeliers hang from the ceiling above. In contrast to the translucency of the ground floor, the upper storey reveals a different perspective. Here, private and intimate rooms such as bedrooms, office and spa, still retain their privileged views, yet are shielded from the prying eyes of neighbours. The volumes and spacial dialogue is still the same, however, as the outer shape is repeated in the design on this floor. 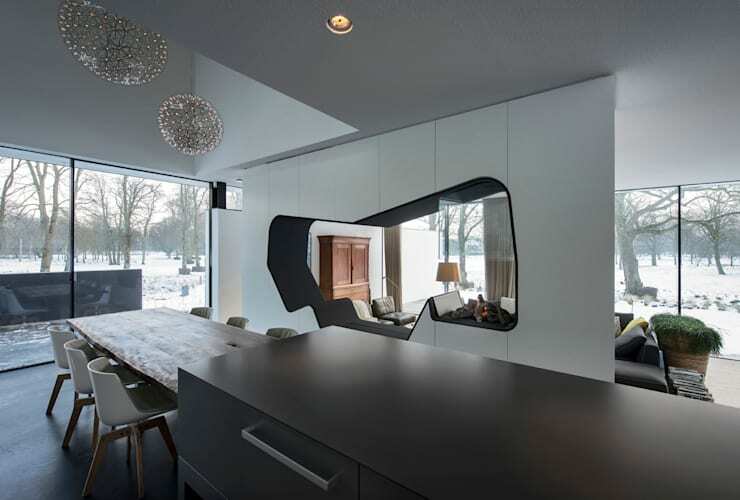 A home that is marked by contrasts and surprises, the occupant is able to have a full blown architectural experience, as around every corner, there is a different twist and turn. 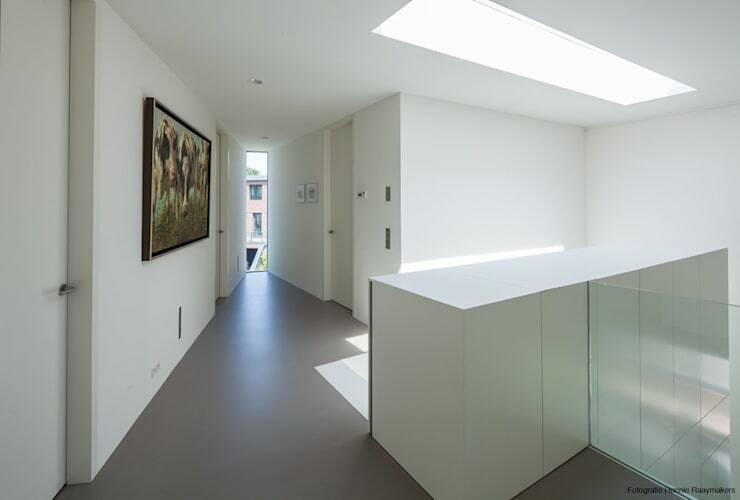 To continue the sense of light and airiness, a large skylight has been installed, as well as dramatic pockets of windows to ensure the intrigue for the external landscape is not lost. Generally speaking, one assumes a balcony would be square, but as this villa is filled with playful examples of geometry, it comes as no surprise to find this triangle balcony. The angular shape seen, is in direct response to the curve of the building, almost as if it antagonising and teasing the external envelope. There is thus, a consistent system that occupies this home; harmony and opposing forces can come together to create exciting and comfortable interior and exterior spaces. In short, it is a finely balanced project, not only in terms of geometry, but between nature and architecture, and privacy and openness. Besides the obviously luxurious and sophisticated character of this villa, it commands and reigns a serene energy of the most spectacular.